The weather's heating up, and you've got more barbecues and potlucks to attend than you can even believe. With this free eCookbook, Simply Deli Salads: 28 Best Recipes for Potato Salad, Macaroni Salad & More, you'll be ready to bring a different deli salad to each one! We've got different types of salad for every occasion, from tuna pasta salad to vinegar coleslaw to potato salads with bacon. We invite you to browse through, print it out, and save your favorites. We guarantee that any party you attend will be filled with the sounds of that “OOH IT'S SO GOOD! !®"
We know you don't want to show up to the party empty-handed, not when you could bring along the absolute best deli salads! Show your friends and family your prowess in the kitchen by surprising them with some unbelievably delicious cold salads. Plus, there are so many different varities that you're sure to find something the whole family will enjoy. The best potluck dishes are those you make yourself, and with Mr. Food's philosophy of "quick & easy" cooking, you're already halfway to one incredible meal. Whether you're looking for ways to spruce up a classic dish, or you've been itching to try something new, our Simply Deli Salads eCookbook is the perfect way to test your skills in the kitchen. Download your free copy of Simply Deli Salads: 28 Best Recipes for Potato Salad, Macaroni Salad & More today. Who doesn't love a good, old-fashioned potato salad recipe! Potato dishes are always a hit with any crowd, and we've got plenty of options so you'll end up being the hit of the party! If you're in a time crunch, try out our Presto Potato Salad (page 2) which proves that you can dishees that are both quick and tasty. If you're looking for some potato side dishes that will knock your family off of their feet, look no further than our spectacular No Bake "Baked" Potato Salad (page 3). With only six ingredients, it really doesn't get much simpler! 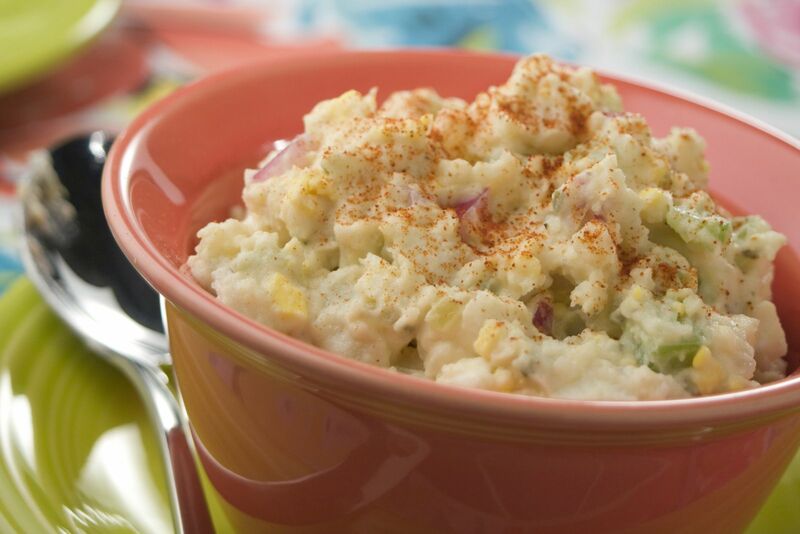 Even better, it's a potato salad with bacon so it's sure to give you that smoky flavor you've been craving. You can even put a twist on an old classic with our patio favorite: Taco Potato Salad (page 5). Not only is it a unique potato dish your family is sure to love, but it's a great way to warm you up on a cold winter's night. If you show up at your friends house with a heaping bowl of deli pasta salad, we're sure you're going to be welcomed with open arms! We know you've been looking all over the place for the perfect, creamy pasta salad that you'll actually be able to get your kids to eat. Even the pickiest of eaters will gobble down our popular Basic Macaroni Salad (page 9). Plus, it's a great way to sneak in some of those all-important veggies! 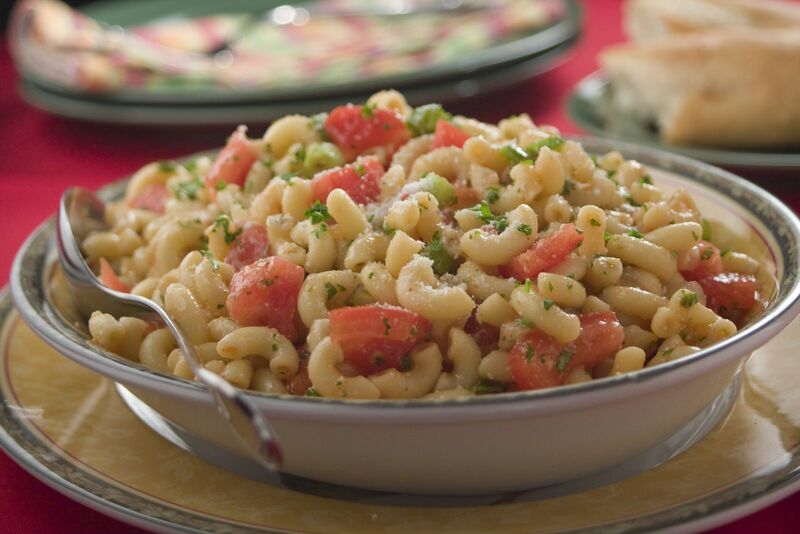 If you're looking for how to make pasta salad that's a little more adventurous, look no further than our zippy Gazpacho Pasta Salad (page 13). This is one of the best pasta dishes around if you're looking for a little extra kick! Nobody can turn down a hearty fruit salad which is why we've included the unusual, but delicious Pasta Fruit Salad (page 15). Filled with all of your favorites, like strawberries, pineapple, grapes, and more, this is one dish that's sure to become your specialty. We know it can be difficult to find the time to whip up something in the kitchen when you can easily go to the store and buy a deli salad there. There are so many precious memories that are made in the kitchen that we think it's worth every second! Many of these deli salad recipes don't involve any cooking or baking which make them the ideal type of dish to make with your kids. You do the chopping, and they do the mixing. Put your favorite radio station on in the background, and you've just become the parent-of-the-year while creating a tasty dish that your friends and family will truly love and appreciate. All of our ingredients are super cheap and easy to find, and with our free Simply Deli Salads eCookbook, you're well on your way to discovering that signature "OOH IT'S SO GOOD! !®" taste you've come to love. The Mr. Food "quick & easy" philosophy fits cooking into your busy lifestyle, not the other way around! Whether you're looking for the perfect spring salad or you just want a salad to pair with your latest dinner, this free eCookbook is your ticket to deli salad heaven. We'd love for you to come on board! If you're heading to a party sometime during spring or summer, chances are that there's going to be a heaping bowl of coleslaw waiting to accompany your barbecued meal. No one knows how to handle outdoor barbecues like the South which is why we're so excited to include one of our best coleslaw recipes: Homestyle Coleslaw (page 18). It's quick, it's easy, and it's a guaranteed hit at any gathering. A freshly prepared coleslaw salad recipe can really brighten up any meal which is why we think you're going to love our Sunny Slaw (page 19). This is one coleslaw recipe that's sure to be a hit every single time you bring it out. 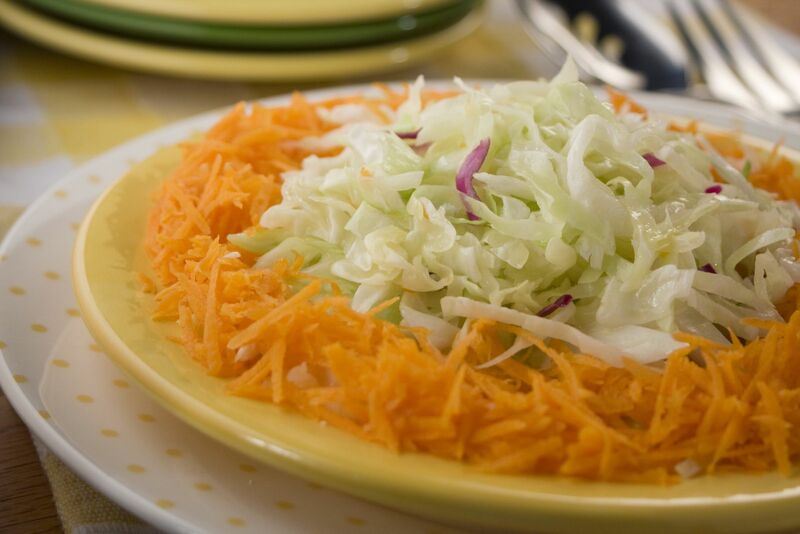 If you're looking for something new, our "German" Coleslaw (page 20) is the best way to add excitment. Using white vinegar instead of mayonnaise, it tastes teriffic without feeling heavy. Plus, coleslaw pairs well with all of your favorite summer dishes like pulled pork, burgers, and more! Ahoy matey! 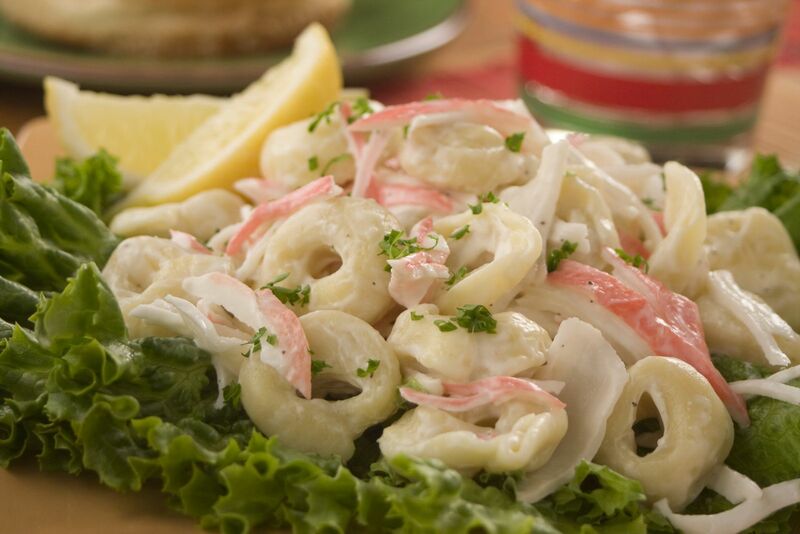 Whip up a little taste of the sea with some of our best seafood deli salads. For a quick burst of lemon, we recommend our Crab Tortellini Salad (page 25). Its creamy, rich flavor makes it the perfect companion to any lunch or dinner. Invoke the roar of the ocean with our Seashell Salad (page 26). Turn mealtime into a nautical adventure by using shell-shaped pasta to dream up a seaside getaway. Seafood can be a hit or miss meal option which is why we've included our no-fail Tuna and White Bean Salad (page 27). Even those picky eaters that think seafood tastes too "fishy" are sure to sneak a few bites of this dish. Plus, the additions of the white beans makes this super healthy with an extra dose of fiber. The nutritional benefits of this tuna salad dish can't be beat! When it comes to deli salad recipes, these seafood picks are top of the chart. As a fan of Mr. Food's Quick & Easy cooking philosophy, I know you can see the value in this free ebook. Try out these potluck deli salad recipes with the free Simply Deli Salads: 28 Best Recipes for Potato Salad, Macaroni Salad & More. Once you subscribe to receive our newsletter, you'll see how much fun it is to be a part of the Mr. Food community! If you've ever searched for quick and easy recipes, fast dinner ideas, slow cooker recipes or anything in-between, let MrFood.com deliver triple-tested recipes straight from our Mr. Food Test Kitchen that are both easy to make and delicious to eat. Check out this free eBook and the MrFood.com site to draw tons of inspiration for your next holiday or meal! I would like to say thank you for your different was you can do with so many apples. That I got 20 buckets 5 gallon size big buckets. That was a good Idea for the strawberries cobber. why not with apples.Thank you . Cherie De Coto. Look like sensible salads to me. wow! Can't Wait to try the recipes. Can't wait to try some of these recipes. Can save a lot of time for those that work full time as me.. I have downloaded quite a few of these books with no problem. Perhaps you're not hitting the save button? You must have a reader program, such as Adobe installed on your computer in order to download the free eBooks, or if you, already such a program installed, you may have to update the program to download the free eBooks.